The last teeth to erupt among the molars are wisdom teeth and they are located in the very back of your mouth. Although most people will have four wisdom teeth, there are instances where people can have fewer or even more than four. With all the complications associated with wisdom teeth, dentists usually recommend removing them as soon as possible after they erupt. This perhaps explains why nearly every dentist is experienced in extracting wisdom teeth. Early removal helps in reducing the possibility of infection and impaction. Wisdom teeth removal is not any different from an ordinary tooth. When removed by a dental specialist, it is painless and a relatively quick procedure. It can actually be performed under local anesthesia. There are, however, instances when your wisdom tooth may have become infected, impacted, or misaligned which may require more attention. Once removed, your wisdom teeth cannot grow back. Odds are, however, that not all the wisdom teeth were actually removed. The total number of teeth that you ought to have as a healthy person is 32. This number usually increases to 36 following the eruption of an additional 4 wisdom teeth. Unlike your normal teeth, usually, the wisdom teeth will emerge much later in life. Depending on when your wisdom teeth got removed, it is common to have soft remnants of the original tissue that formed the tooth (follicle) present under your gums. Although possible (but very unlikely), that follicle remnant could form an additional tooth. However, none such cases have so far been conclusively documented. 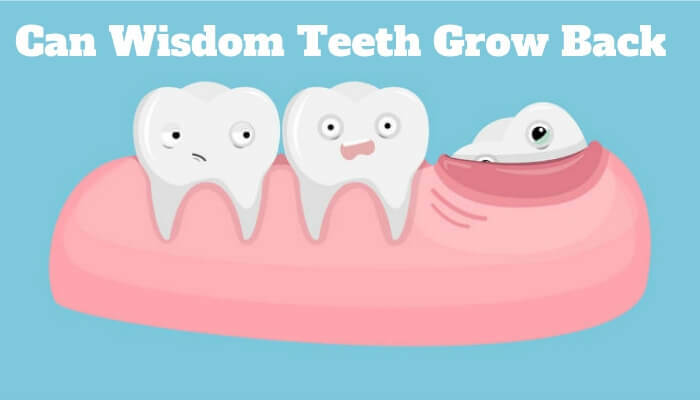 Although the re-growth of wisdom teeth is extremely a rare occurrence, it is quite possible to have more than the normal 4 wisdom teeth. If that happens, you may require additional extractions after the first set of wisdom teeth has been removed.